Last weekend, I taught Communication with the Plant World, a course that focuses on connection with these sessile beings. Teaching plant communication at Damanhur—where the research that gave birth to the course first began—always provides a special boost. 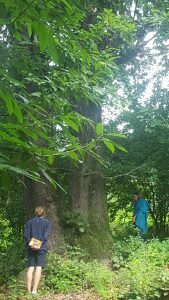 And this time, in addition to the plants of the Sacred Woods Temple, we spent half a day communicating with the oldest tree in Damanhur and her green family. La Grande Quercia (the Great Oak) is ~375 years old (give or take a year or two). She lives in the nucleo community of Cornucopia, and this weekend, she told us her name: Amok Ashakran. After a plant communication course, I am always both inspired and sad. Sad because it is over and I will miss the people and intense experiences we shared. Inspired by these same people and the openness of the plant world. How exhilarating to witness individual and collective revelations made possible by the simple act of listening to one another! More and more, my students are scientific professionals and business leaders looking to connect to the plant world beyond their traditional methodologies. They intuitively feel there is more to learn than what they find in laboratories and think tanks. They seek to explore more subtle interspecies connections with plants in order to co-create with the Earth itself innovative solutions to the world’s problems. This time was no different. The group spanned multiple generations and various professions. Each person successfully developed a two-way channel of communication with the plants encountered. The messages received in each dynamic nourished their personal/professional desires, while providing me with direction and inspiration for my own interspecies research in both scientific and spiritual realms. Together, we shared these experiences with the various beings of the forest. Thanks to the connections running above and below ground and the flowing energy of the Synchronic Lines, certainly what we learned will not stay only between us. Without a doubt, the knowledge has already begun its journey across the planet. Via dreams, intuitions and the like, its essence spreads for others to receive and develop. …. consciousness itself is a flavor of madness, set against the thoughts of the green world …. frightened people mocked her for saying that trees send messages to each other. She forgives them all. It’s nothing. What frightens people most will one day turn to wonder. And then people will do what four billion years have shaped them to do: stop and see just what it is they’re seeing … we all travel the Milky Way together, trees and humans. . . . In every walk with nature we receive far more than we seek. The clearest way into the universe is through a forest wilderness. How do we integrate this knowledge and these experiences into everyday life?